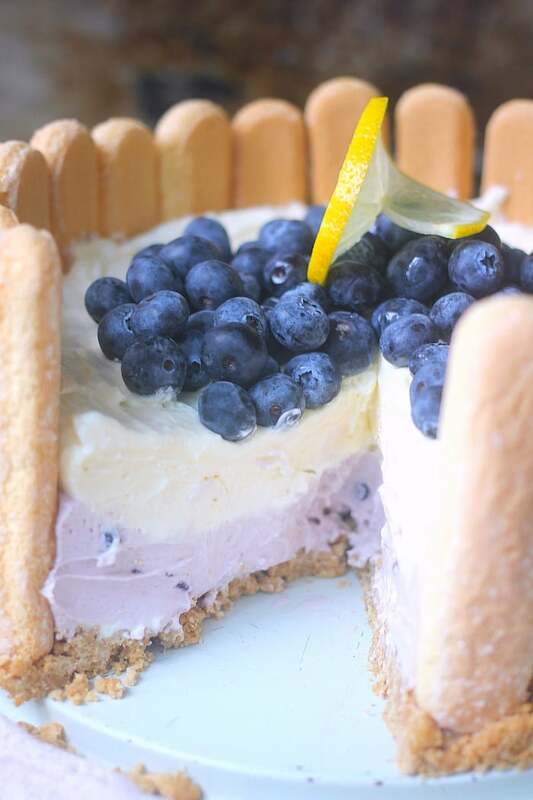 Blueberry Lemon No-Bake Cheesecake is an impressive but incredibly easy summer dessert that wows! 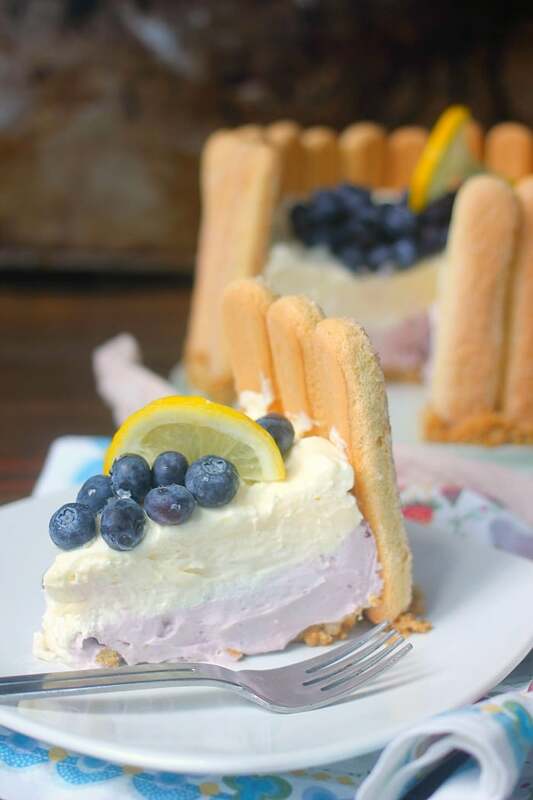 The blueberry and lemon cheesecake fillings are layered together and ladyfingers are used as the outside crust for an elegant look! One of the things I love so much about no-bake cheesecakes is how incredibly quick they are. This beauty is ready to go into the refrigerator in just about 20 minutes! Are you sold? If you’ve ever made a traditional cheesecake then you know it is quite the process and time commitment. And don’t even get me started about the stress involved in trying to make sure the top doesn’t crack! The advantage of no-bake cheesecake is you don’t have to do any of the things that making a traditional cheesecake requires: You don’t have to use a water bath. You don’t need to have your oven on for a ridiculous about of time. You don’t have to wait basically 24 hrs before you get to finally eat it! Nope! None of that! The process of making a no-bake cheesecake is quite simple: A basic whipped cream is folded into a mixture of sweetened cream cheese. The cream cheese mixture can be plain or it can be flavored. The filling is then poured into a crust and allowed to chill to firm up. That’s it. Seriously. That’s it! 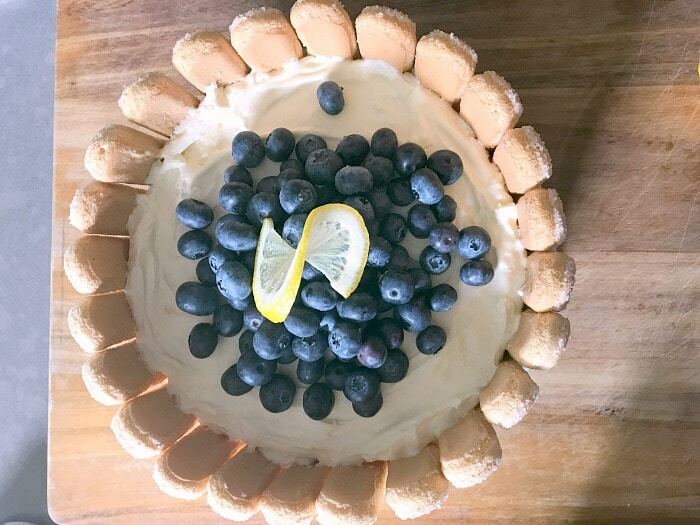 For this particular Blueberry Lemon No-Bake Cheesecake, I split the cream cheese mixture in half and added lemon curd to one half and blueberry jam to the other half. Super simple and it turned out quite impressive! This recipe could so easily be adapted! Don’t like blueberry? Use raspberry, strawberry, or cherry jam instead! It would also be perfectly acceptable to mix all of the filling together instead of layering it as I did. But I just love the look of the two layers when you cut into it! In a food processor, pulse the cookies until they become crumbs. 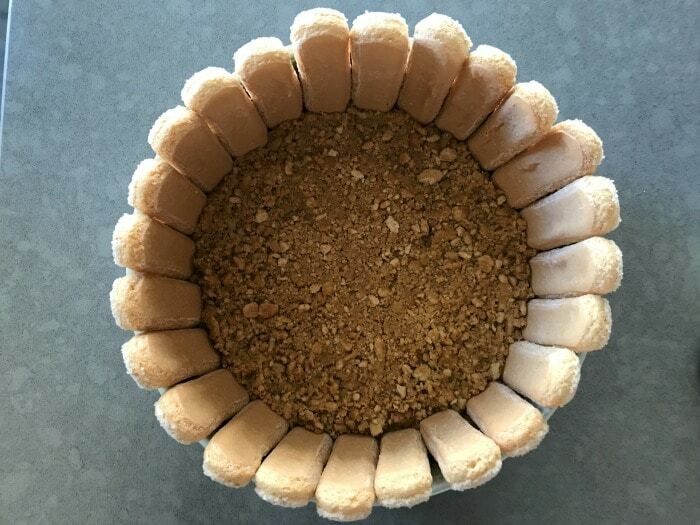 Combine the cookie crumbs with the melted butter and press them into the bottom of a 10-cup springform pan leaving about a 1/2" border around the edges for the lady fingers. Stand the lady fingers up along the edge of the pan with the tops facing out. Press the cookie crumbs into the lady fingers to help hold them in place. Place the pan in the refrigerator to firm up while you prepare the filling. Using either a stand mixer with the whisk attachment, or a hand mixer, whip the whipping cream on high speed until stiff peaks form. Watch this closely and stop as soon as you reach stiff peaks because going farther will begin to make butter. In a separate bowl, beat the cream cheese until soft. Add the lemon zest, lemon juice, and powdered sugar. Remove half of the cream cheese to another bowl. Mix the lemon curd into half of the cream cheese and then fold in half of the whipped cream. 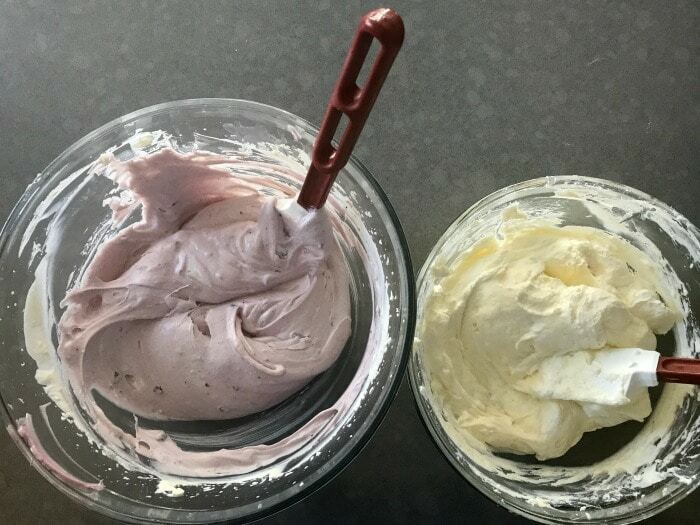 Mix the blueberry jam into the second half of the cream cheese and fold in the other half of the whipped cream. Pour the blueberry cheesecake filling into the prepared crust. 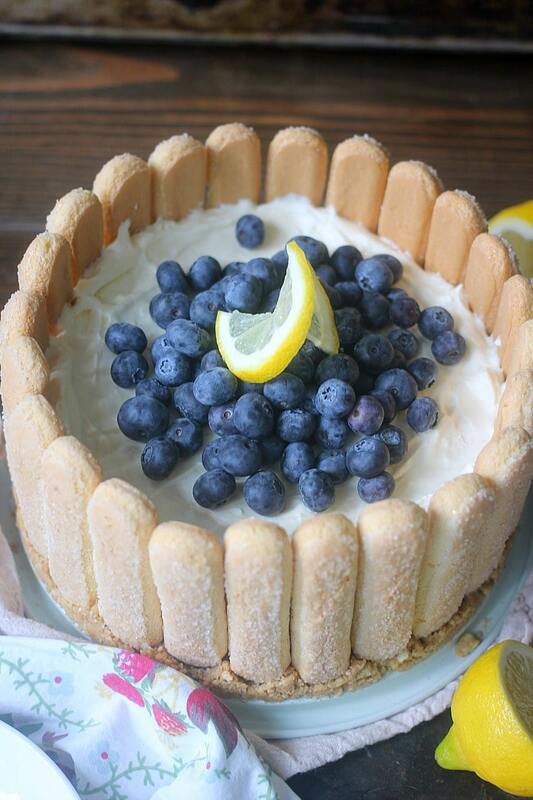 Top the blueberry layer with the lemon cheesecake filling. Chill for at least 4 hours, or until firm. Top with fresh blueberries and lemon zest if desired. Awe, thank you, Pat! Let me know how yours turns out! This cake look fascinating and so easy to make without any hassle of baking in oven or something. Flavors are absolutely soothing i.e. blueberry and lemon. 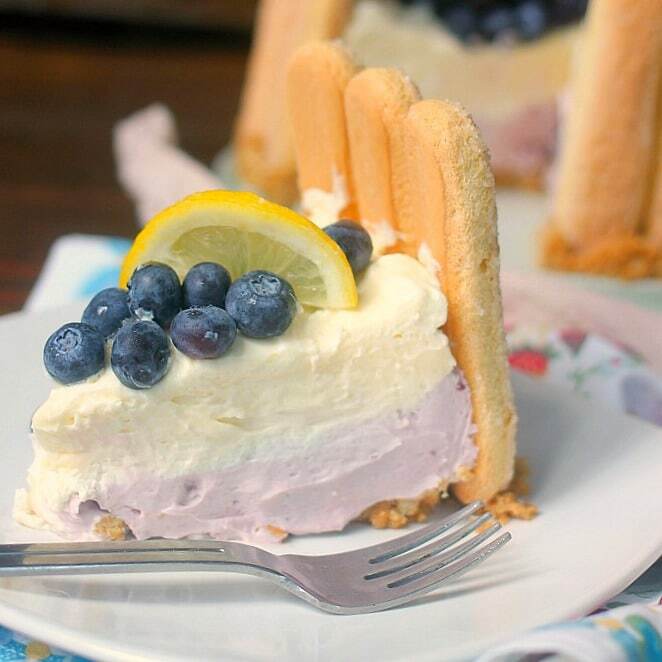 Crunchiness of lady finger and softness of creamy cheese of blueberry and lemon totally balance the both. 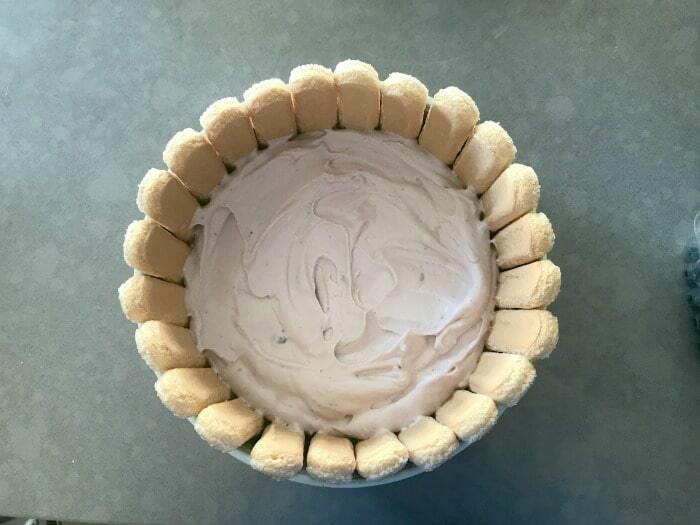 Really love to make this no-bake cheesecake for my lovely daughter. Thank You for the recipe. My pleasure, Richa! You and your daughter will absolutely love it!